PRICE For HK$ 100, Mr. Lui will come to your home to provide a quotation. This quotation fee will be deducted if you decide to go ahead with the repair. 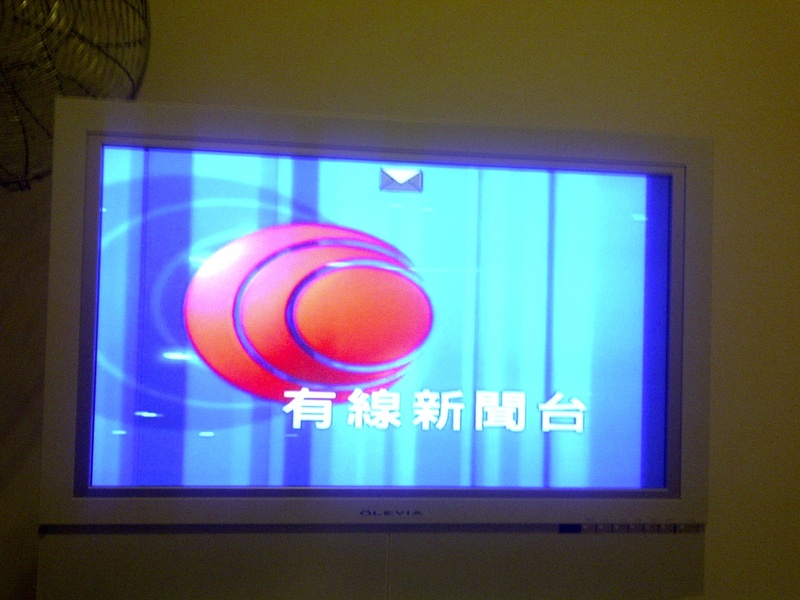 The cost of repairing our TV was HK$ 750. Our 31″ Olevia flat-screen TV was 3 years old when it broke. It was a “free gift” from an internet service provider. With the price of electronics dropping all the time and improvements in technology, it really wasn’t worth the time, effort or cost to have it fixed. Many people we talked to also claimed that flat screen TVs simply cannot be fixed. We decided to try anyway because we couldn’t stand the thought of creating more toxic waste. In the past, when we used TVs for 10 or 15 years, it was quite easy to find a TV repairman. The emergence of ultra-cheap manufacturing from China and the ever dropping prices of electronics has led to the demise of the repair business. We no longer repair or re-use, we simply replace. This has created a sea of waste, that has become a health and environmental hazard. But that is a story for another day. After a bit of searching, we found a repairman. He provided a quotation over the phone for HK$ 900. He however seemed reluctant to take on the job. Not satisfied, we contacted the local environment group Greeners Action. They recommended Mr. Lui, whom we ended up using. We contacted Mr. Lui and arranged a time for him to visit. At the appointed time, Mr. Lui arrived at our apartment. It took him about 45 minutes to dismantle the TV and ascertain the problem. (It helps if you clear the space near the TV and have a large towel handy to protect the screen) He gave us a quotation of HK$ 750. According to Mr. Lui, only 60% of broken TVs can be fixed. If it can’t be fixed, you just pay the HK$ 100 quotation fee. We agreed to go ahead with the repair. Mr. Lui said he would need to go to Shenzhen to buy the spare parts. A few days later, Mr. Lui contacted us and we arranged for his second visit. He came and installed the new part and the TV has been working fine ever since. You may be asking, what would have happened if after the repair, the TV still hadn’t work. Based on our past experiences, repairmen generally have a good idea if they can or cannot fix something. With their reputation at stake, they probably won’t take a job unless they are quite confident they can fix it. Mr. Lui mentioned that he has been in the business for over 40 years. Based on his experience, cheap TVs (PRC brands) are easier to fix because of their simpler design and use of standard parts. Japanese, Korean and Philips TVs tend to use more customized parts which are harder to find. All in all, we are very satisfied with Mr. Lui’s service and have no regrets about repairing, instead of replacing, the TV. However, if you decide not to fix your TV, or have any other electronics you no longer want, you can send it to these convenient drop off points or arrange to have it picked up by EPD approved e-waste recycling centres. Thanks for reminding us the good old value of repairing things! Reparing is environmentally sound. Repairing means less garbage. I’ve seen someone dump their nice TV just because the remote-control isn’t working, which takes only few minutes to fix. I know because I am an engineer and have been fixing things in my house. thanks a lot for your story. I have a 37″ Olevia that just broke after using it for almost 3 years. Coincidence? I’ll call Mr. Lui and give it a shot. I will let you know how it goes. Have a 4yr old 40″ flatscreen that stopped working. Called Mr Lui. His english is ok, but not great, so I asked someone to translate. He was surprisingly quick, arriving at my house 2hrs later (only 15mins later than he said). A gentlemanly older guy, very polite, assessed the likely problem within 10min, and gave an estimate ($700-$1100, depending on what parts required). I agreed and he set about work right away – he had a few containers of spare parts, a soldering iron, and a couple of testing meters with him. He said the power supply is normally the offending part, and typically easy to fix (as it was in this case – 3 capacitors on the power supply panel had failed). 45min later he had it all back together and working perfectly. All for $700. Fantastic, especially considering I was going to recycle the tv and spend $8-$10K on a new one! I highly recommend him if you have similar troubles. I foung Mr Lui on this website after googling TV repair man and gave him a call about our TV which had lost its power. He arrived promptly today and found the problem after a few minutes – a switch we knew nothing about which had got turned off as it was where you would hold the tv to move it. The switch was missing from the diagrams in the manual when I was reading up on troubleshooting. He immediately said that the TV had no other problem and just charged the $100 for the visit. I highly recommend Mr Lui for his honesty ( he could have said anything was wrong and we would not have known any better ), his promptness and his courtesy. I just got my Samsung TV fixed by a nice gentleman named Wai Man. He is in Sai Ying Pun. Came within 20 minutes and replaced capacitors within 30 minutes. All for HK$500. Found him on YP and thought just give it a try, why not. And he was great. Did not really speak English though so would need a translator if you don’t speak some. My 46″ Sony TV (3.5 years old) is out of order. Sony site request $500 for checking, + $880 for repair. maybe more after checking by the technician. Crazy fee. I would rather buy a new one at that fee. I will try to call the technician you guys said.